Rubber Grip offers smooth touch to hand. 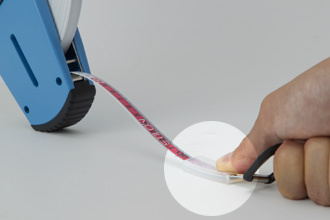 Possible to hang the reel on forearm, so hand can be used freely. 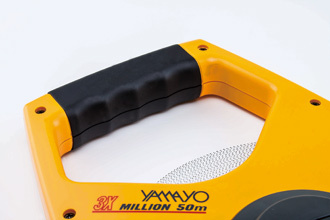 The mechanism is simple and sturdy even though winding speed is 3 times quicker than conventional tape measures. Thereby, this gear system prevents from entering the dust and/or sand. Durable and keeps for long use. 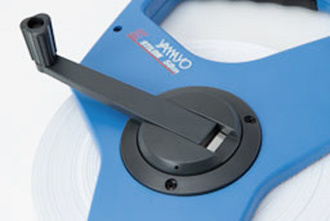 Built-in the system of reducting tape backlash. Rubber End prevents from slipping. Shock absorber resists the shock when tape returns finally.